How much firewood did Colonial Americans use? We cut and burn our own wood to heat our house in the winter, and while it seems like we go through a large amount of wood it is nothing compared to what Colonial Americans would have used. Most Colonial homes would have needed at least 40 cords of wood for heating and cooking over the course of a year. A cord of wood is 128 cubic feet or roughly a stack of wood 4 feet wide, 4 feet high, and 8 feet long. 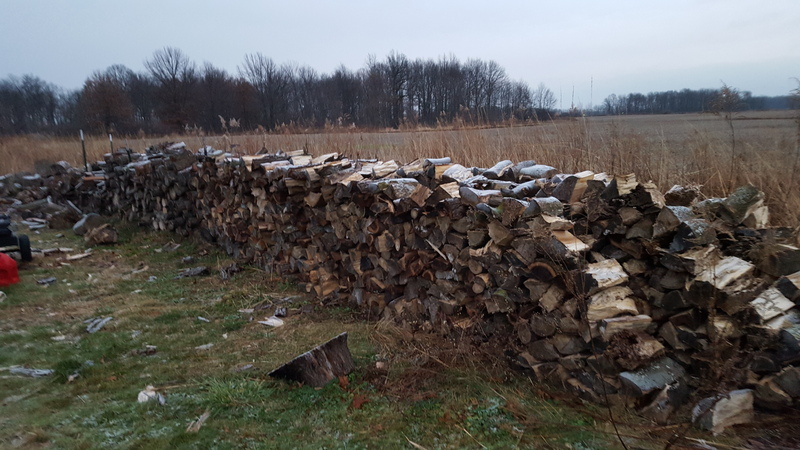 Below is a picture of the Stevenson farm woodpile. We have about 5 cords of firewood. Imagine multiplying our wood pile by 8 or 9. That is how much wood most Colonial Americans would have used in one year. Worse yet, imagine having to cut and split all of that wood by hand. We use a chainsaw and a hydraulic log splitter to cut and split our wood. Early Americans would have chopped the trees down by hand with an axe and then split the wood with a wedge. We still use a wedge, or maul, on our farm to split some of our wood. 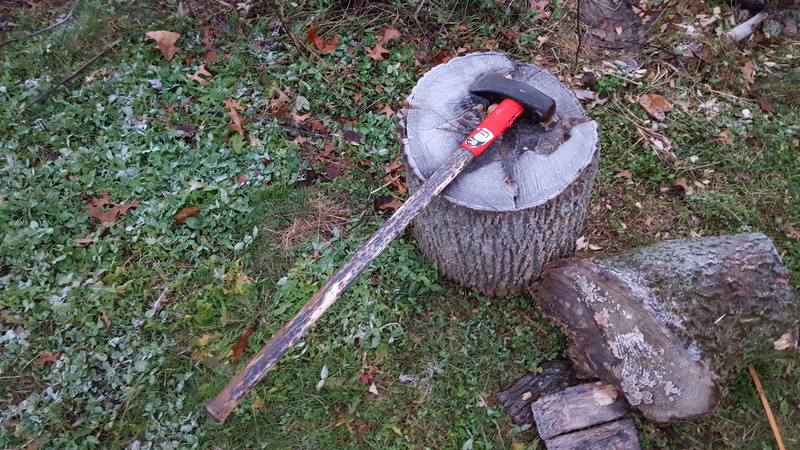 Splitting wood by hand is a great way to burn some energy and release some stress, but it is hard work. How then did Early Americans manage this precious resource, seeing as they needed so much wood for heating, cooking, and for building materials? Most farms had a wood lot, which was an area of land dedicated solely to growing trees. A typical wood lot would be approximately 20 acres. Depending on the tree sizes, one acre of wood lot could provide enough wood for one year. With a 20 acre wood lot, the newly harvested acre would then be replanted with new trees that would then have twenty years to grow into mature trees. Colonial farmers could also clear woodland for firewood and then grow crops. Clearing land was extremely hard work and would usually require help from neighbors to get trees cut down, stumps removed, and the ground plowed. Why then did Colonial Americans need so much wood? Today we have larger homes, but can heat them with a fraction of the amount of firewood. Some might say that we use less wood due to gas and electric ovens now providing a means to cook without a fire. However, the primary reason Colonial Americans used so much more wood was not related to cooking but instead was due to their tremendously inefficient fireplaces. Almost 90% of the heat produced by a fire in a traditional Colonial fireplace would escape through the chimney. Not only that, but chimneys were drafty, letting in cold air. Around 1750, Benjamin Franklin recognized the problem and set to work developing a better fireplace that would reflect heat into a room, instead of up a chimney. He invented the Pennsylvania Fireplace, sometimes called the Franklin Stove. Franklin’s idea of using heat exchangers to transfer heat into a room is still being used in fireplace inserts and cast iron stoves today. Franklin was not the only one to develop more efficient fireplaces. Count Rumford developed a tall and shallow fireplace with angled walls to reflect heat into a room. Rumford was born in Massachusetts in 1753, but as a loyalist he moved back to England in 1776. He spent some time working in the Bavarian government. He later returned to England, and in 1796 he designed the Rumford fireplace. Both Franklin’s and Rumford’s fireplaces helped cut back on the amount of wood Americans were burning. Into the 19th century, Americans started burning coal to provide heat. With the use of fossil fuels for heat and energy, the need for wood continued to decline. Thus, the old way of cutting trees on the 20 acre wood lot fell by the wayside. Some people, like myself, continue to use firewood for heat. For our family it provides a warmth for both the body and the spirit, as there is nothing quite like a roaring fire on a cold winter’s day.